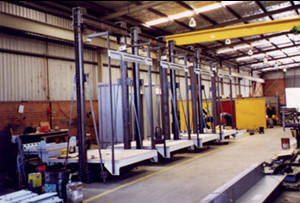 Elevator Sales Pty Ltd is Australia's largest independent lift equipment manufacturer. The factory is located in Bayswater, 10 kms from Perth - capital city of Western Australia, within easy reach of air, rail and sea cargo facilities. It is conveniently located and is ideally placed to service both the South East Asian market, with its large construction industry and the Australian market. Our computer technology, computerised machinery and industry experience enable us to be competitive through efficiency in design and manufacture. The company manufactures a full range of lift equipment and regularly develops new products in order to meet the demands and high standards of this industry. We design, manufacture and supply components, hydraulic and traction lift packages to meet Australian or British/European lift safety codes. The company has an export market in the Asia Pacific region. Equipment using our technology has been installed in lift packages sold throughout the region from China to the Antarctic and in between.